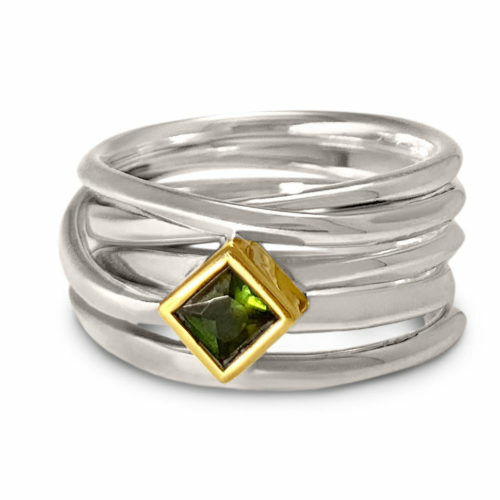 I am always interested in working with line, exploring manipulation of the line itself, and of volume created through line. 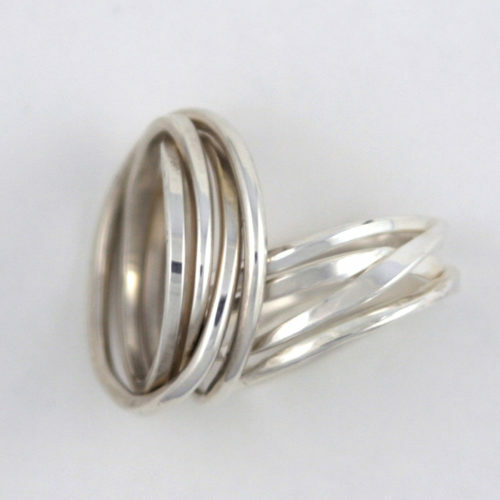 The Onefooter Ring is an example of this. 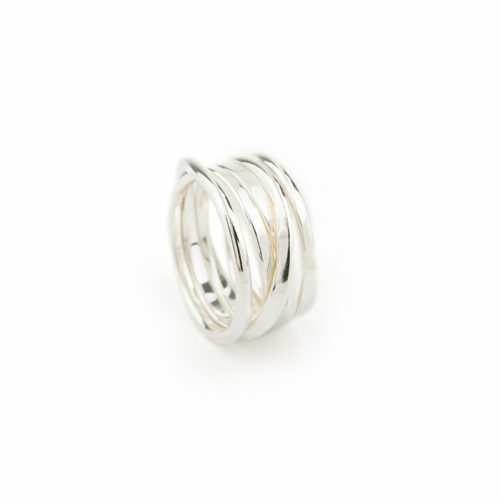 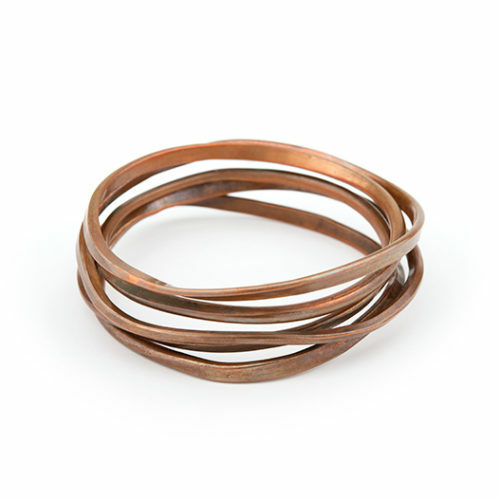 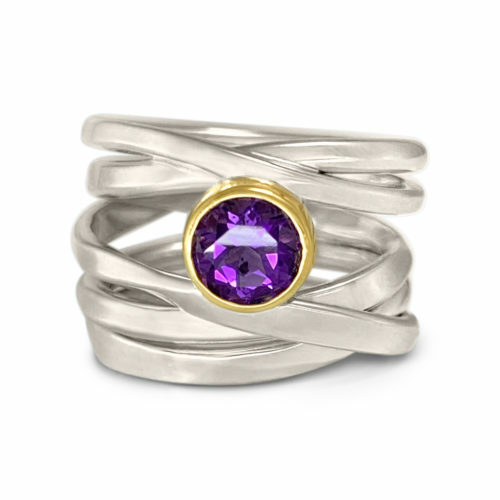 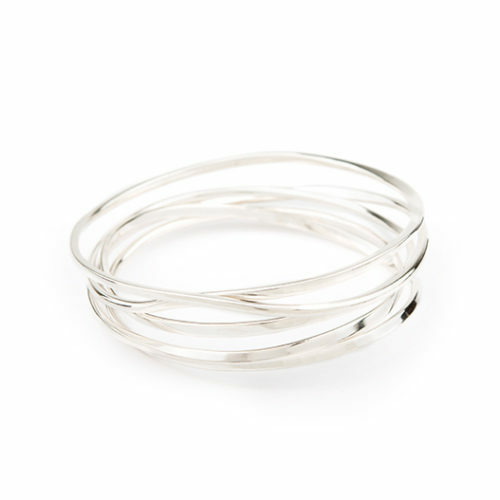 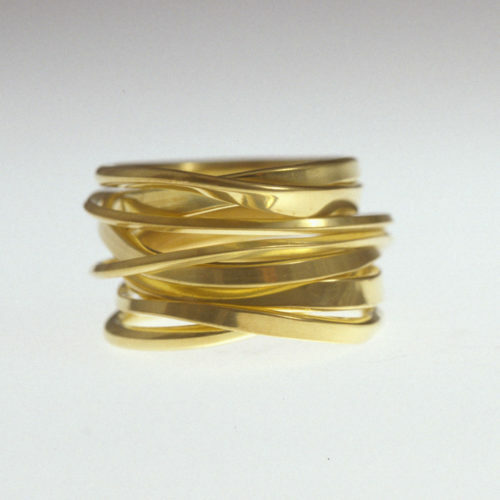 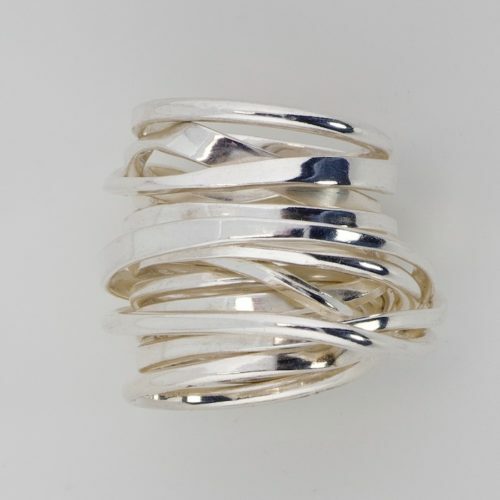 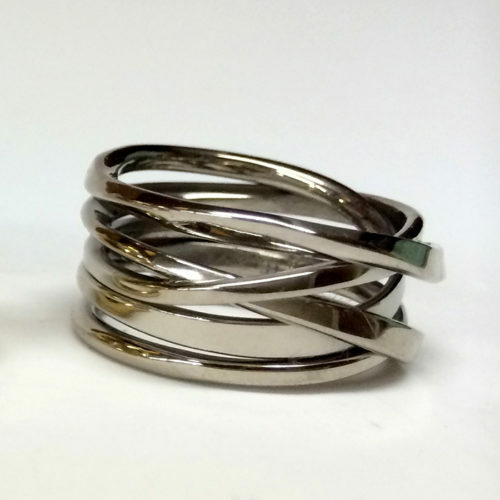 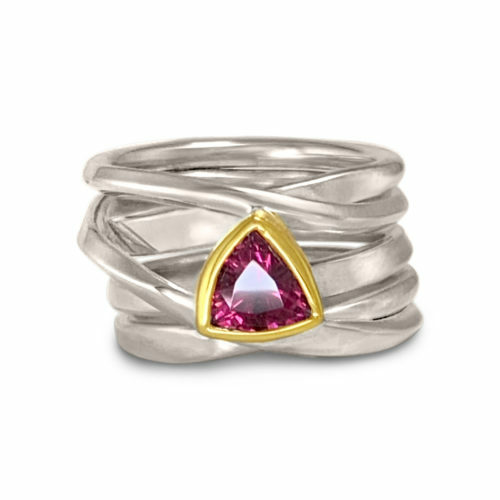 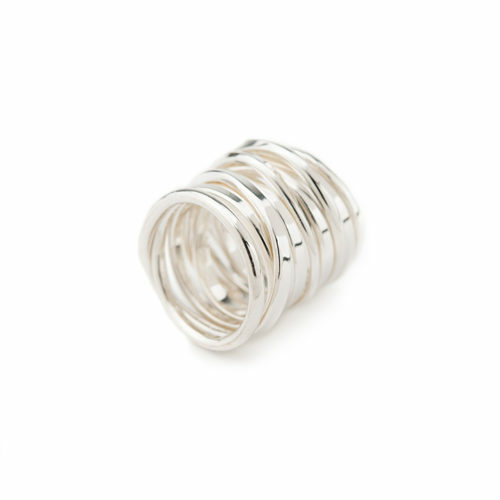 One foot of gold or sterling silver wire is first forged in various directions, then wound repeatedly into a continuous loop, wrapping around the finger many times without beginning or end. 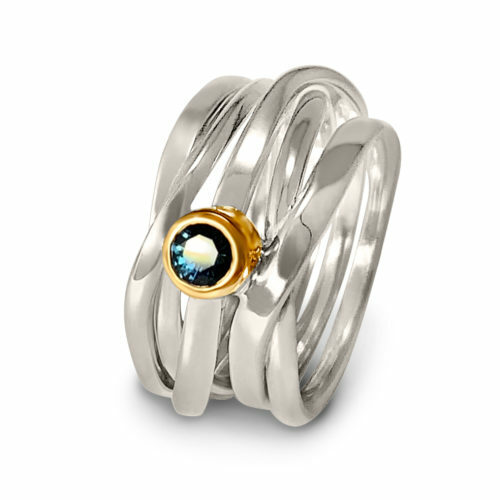 Each ring is unique and different; no two are the same. 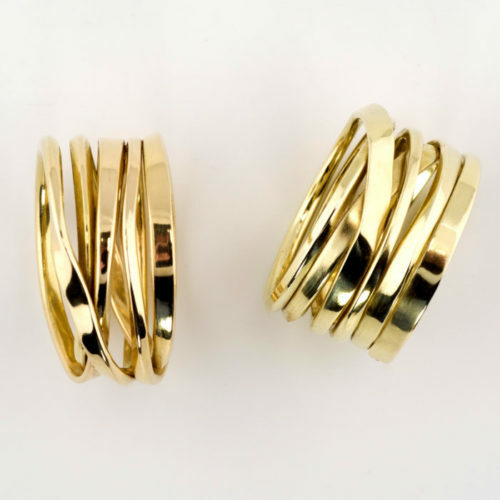 Onefooter rings come in different lengths, can be made out of sterling silver, 14K or 18K yellow, rose, white, and european green gold. 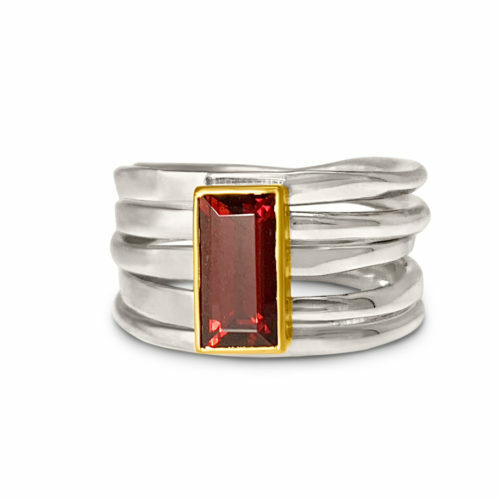 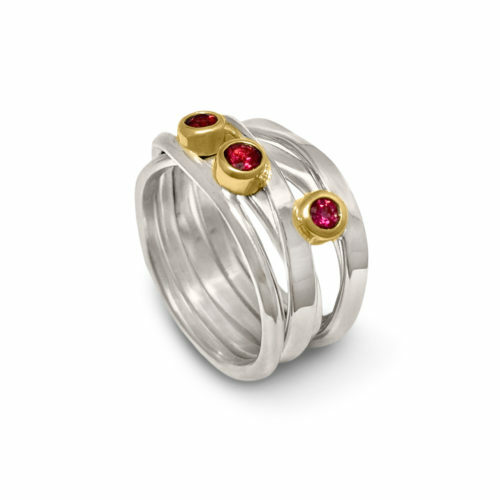 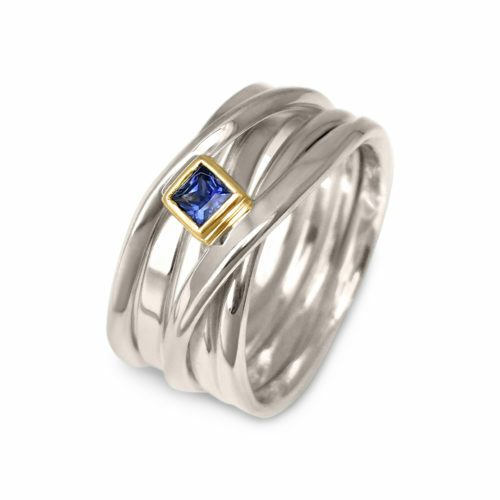 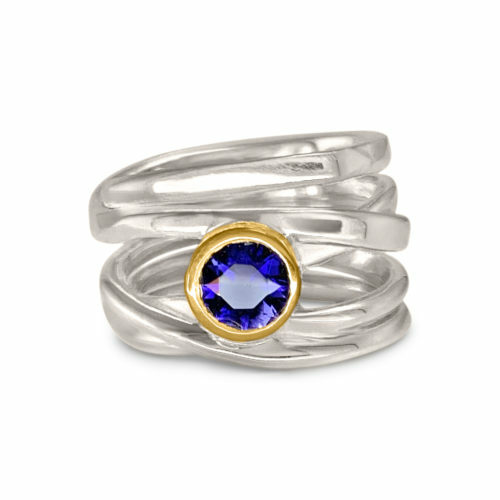 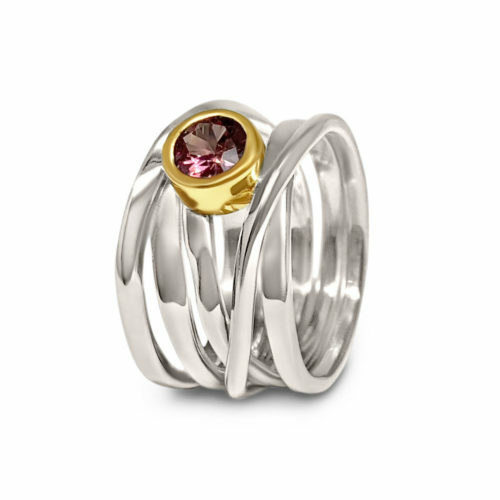 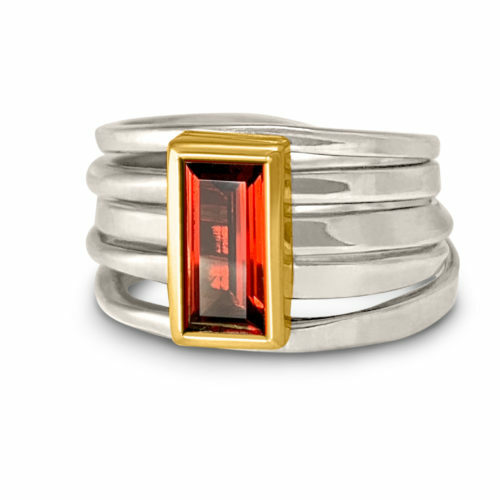 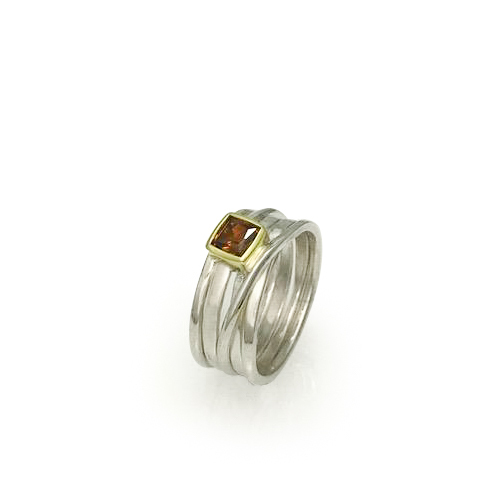 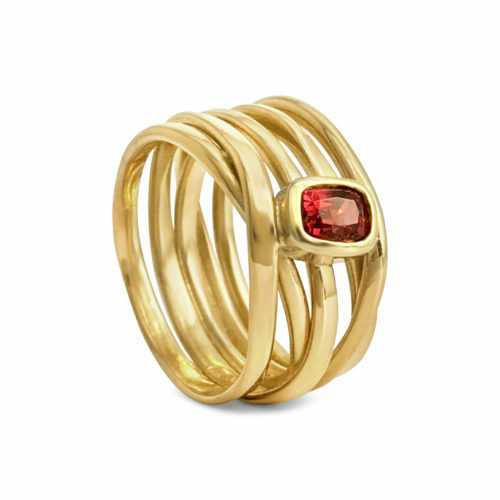 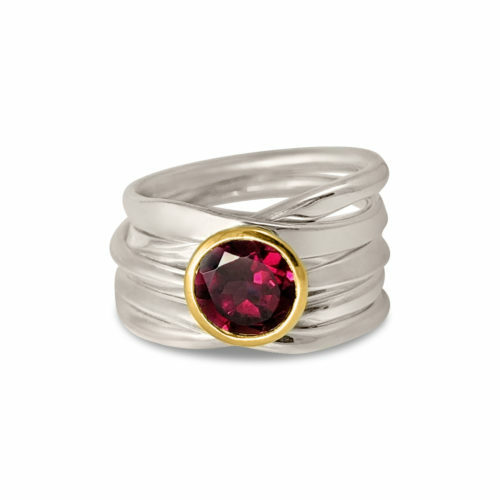 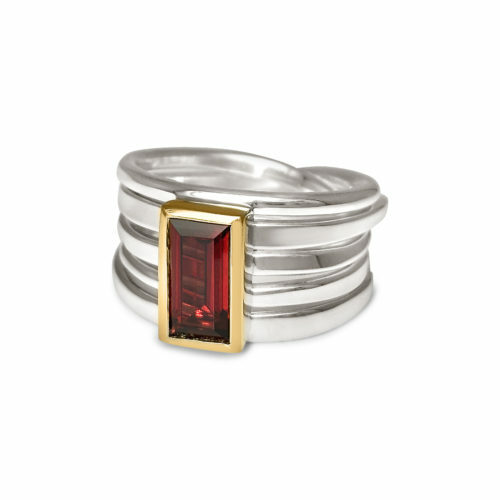 and can be set with precious stones such as sapphires and rubies. 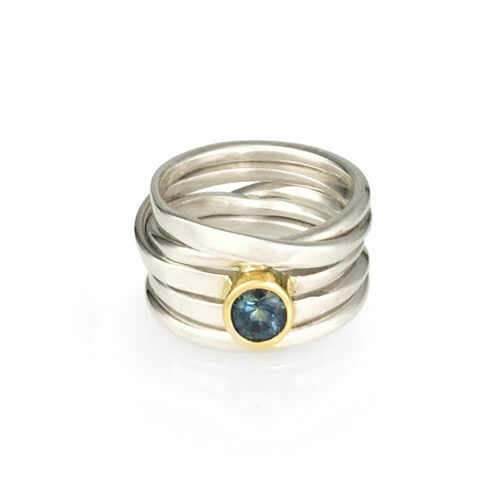 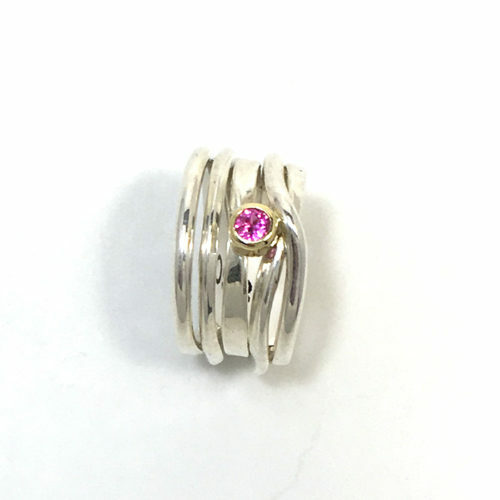 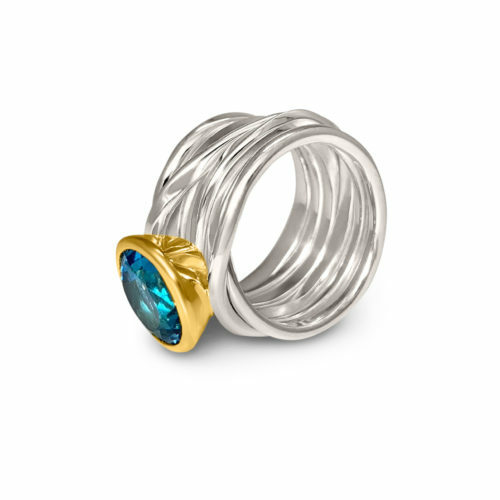 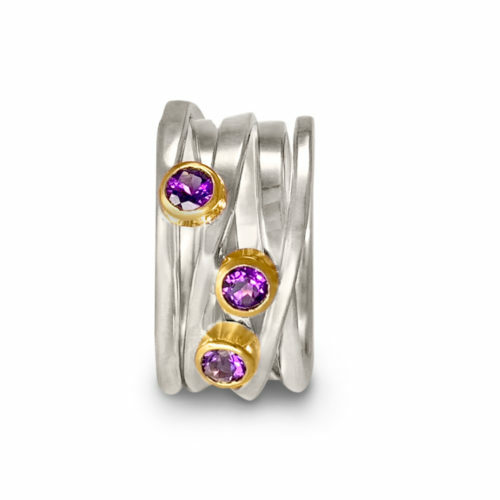 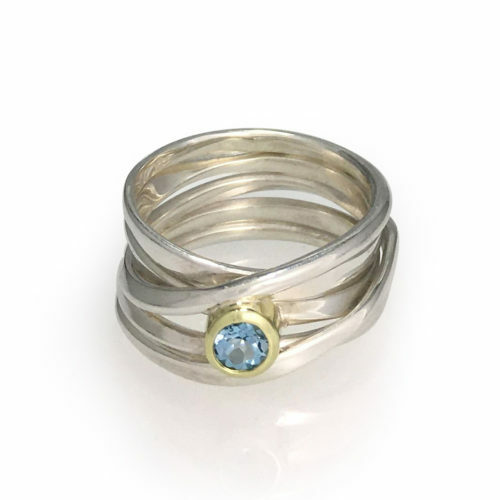 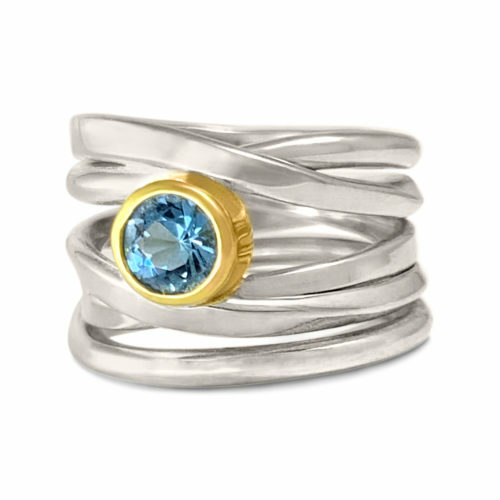 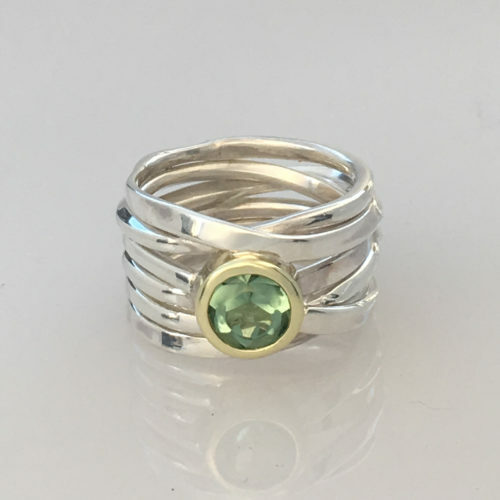 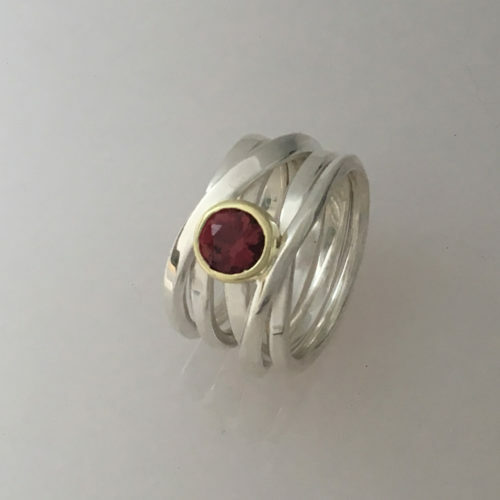 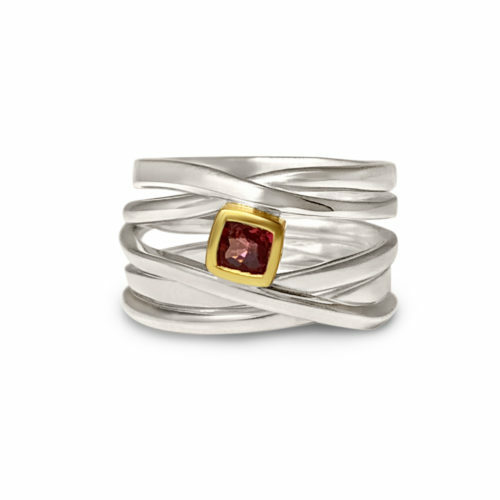 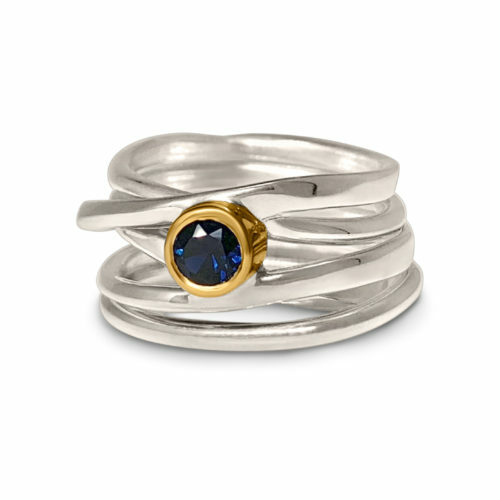 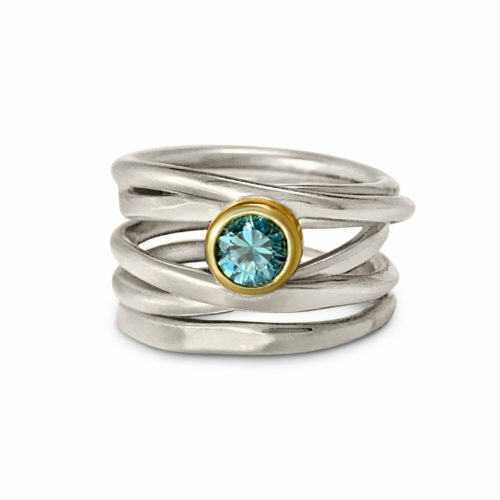 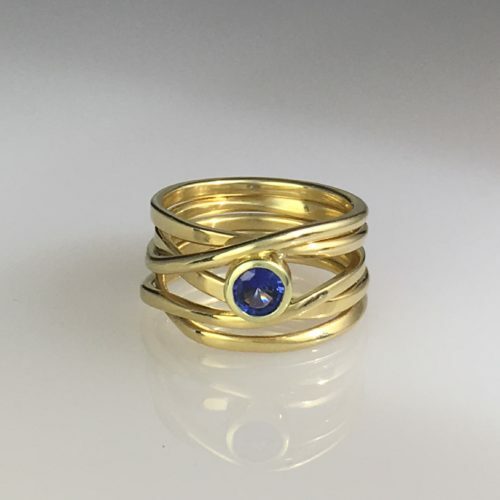 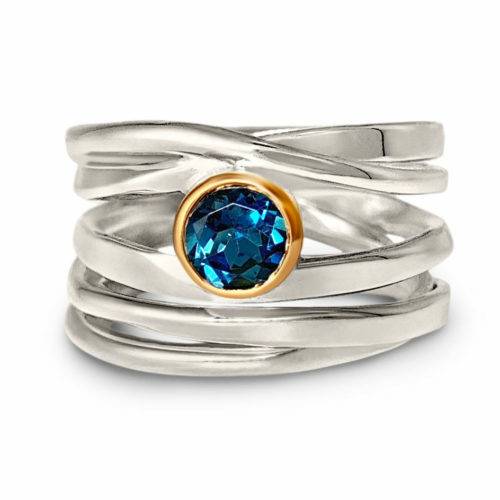 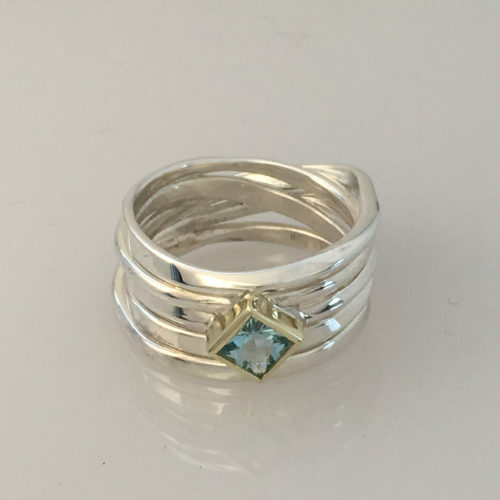 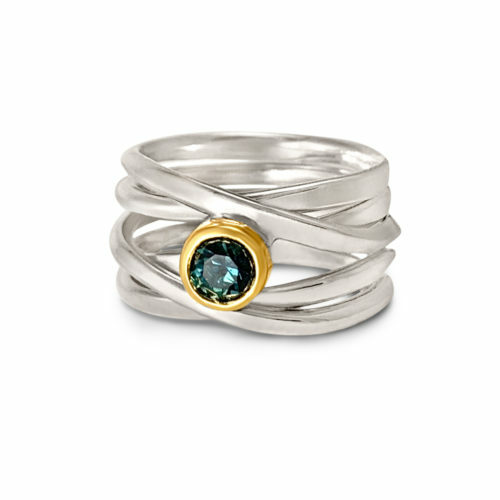 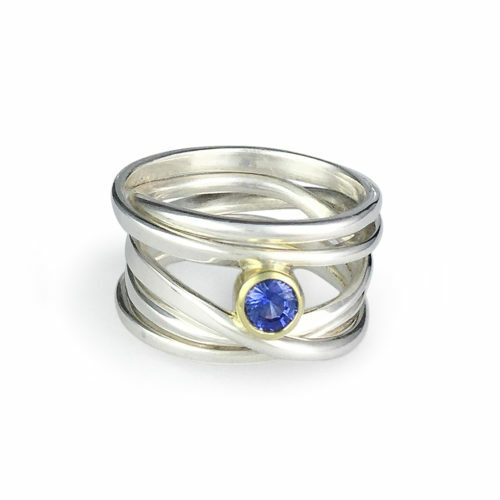 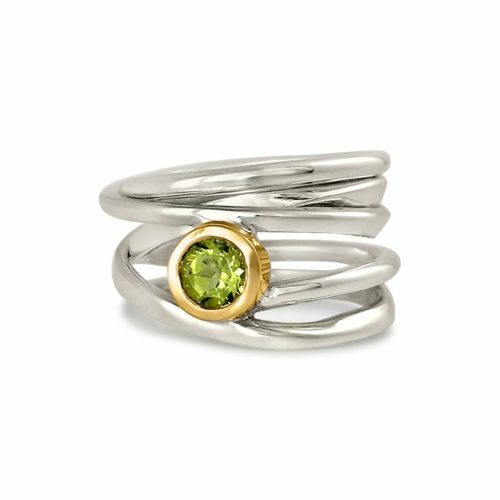 My new passion is making rings in the Onefooter series and setting them with coloured stones such as sapphires, rubies, aquamarine and more. 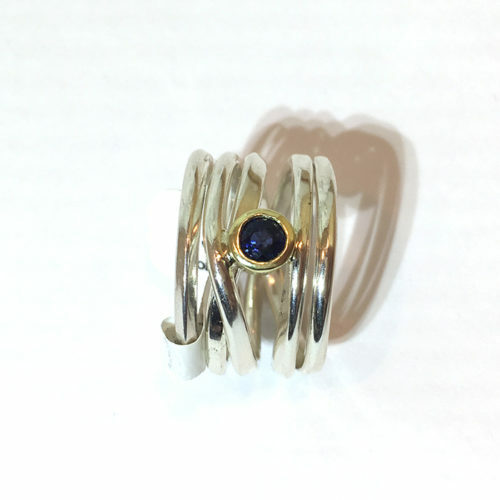 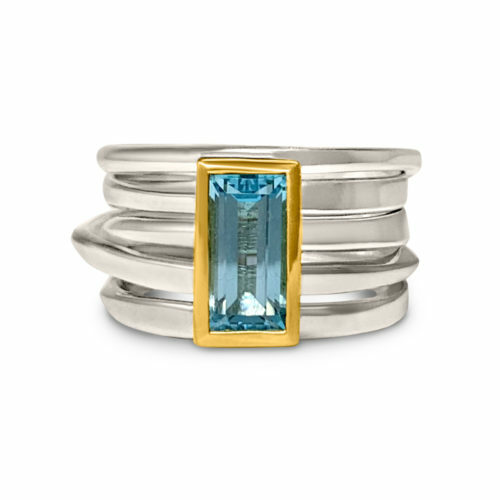 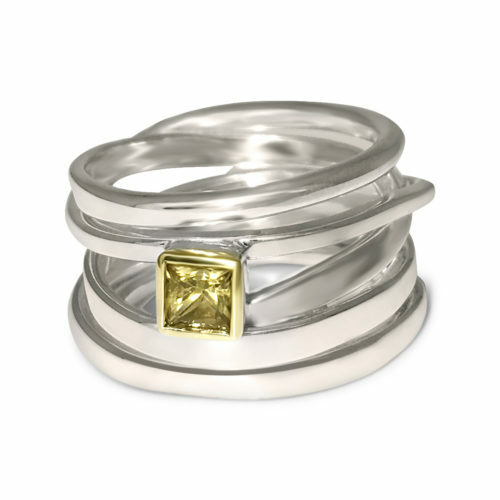 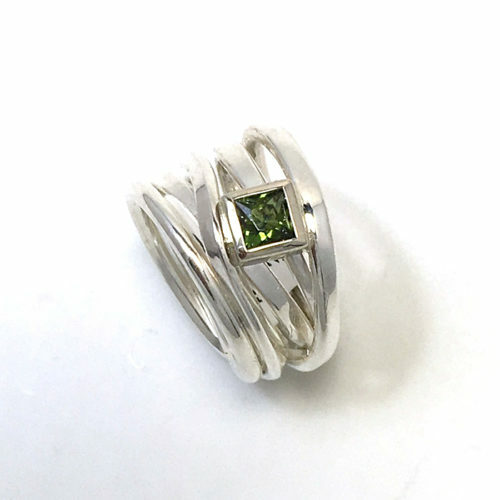 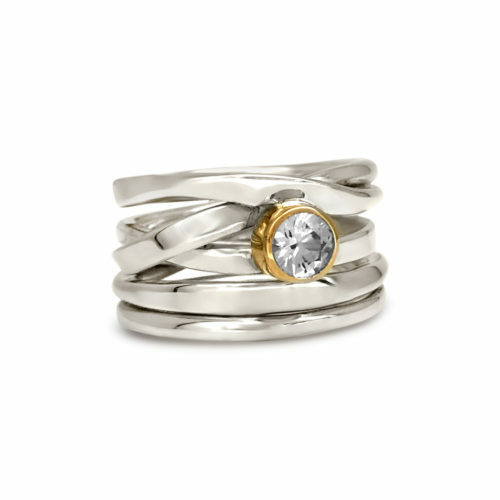 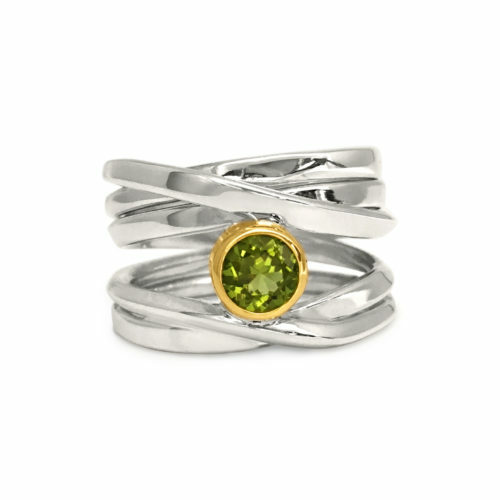 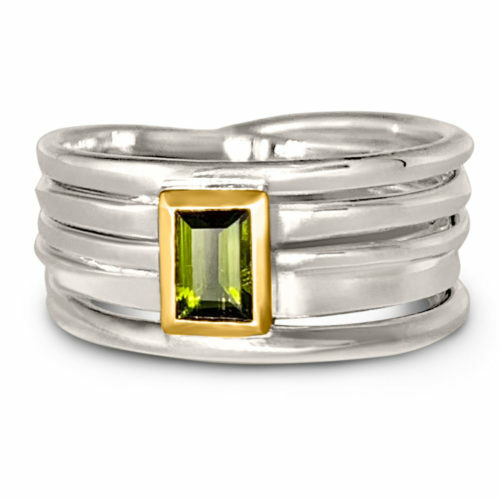 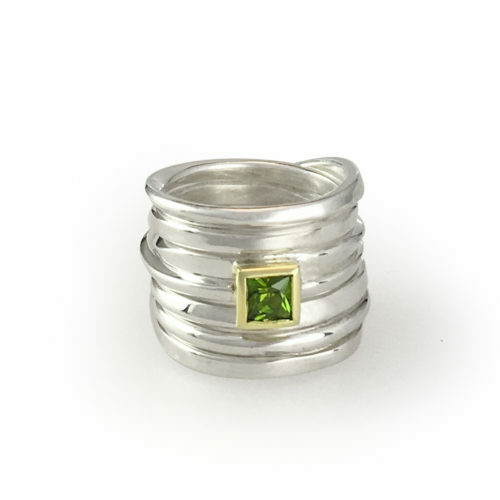 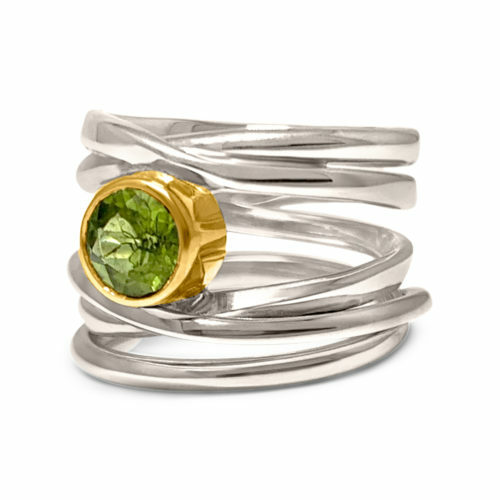 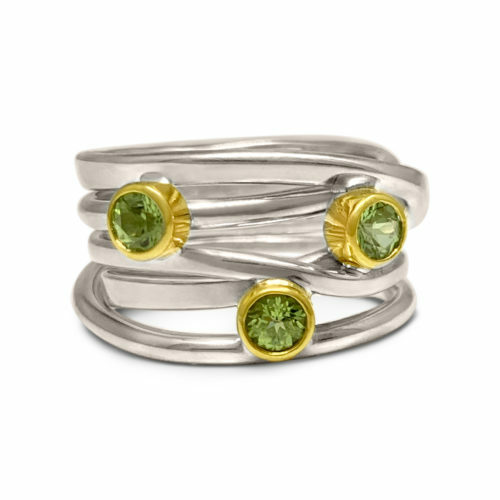 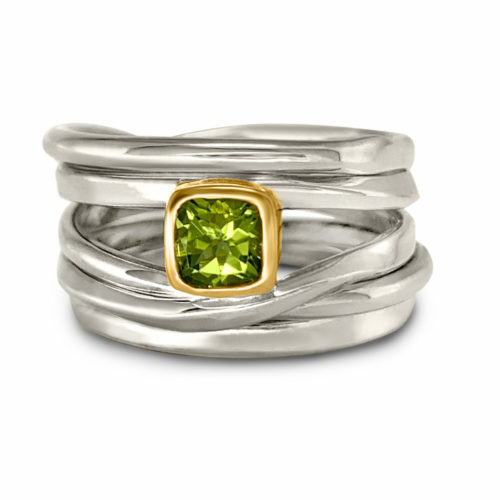 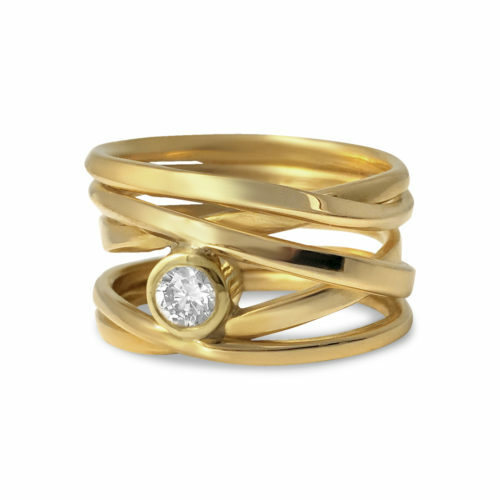 Because I treasure the stones the earth blesses us with, and out of respect for the stone cutters who use their expertise to bring out the stone’s beauty, I set the stones in 18k yellow or white gold. 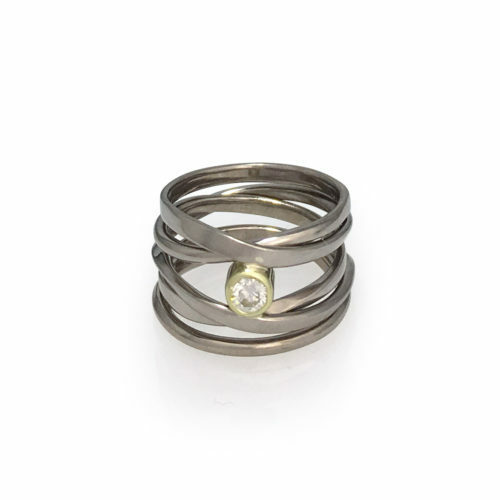 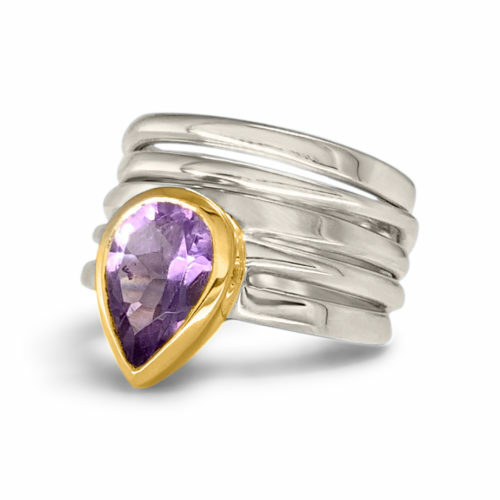 Browse the collection of One-of-a-Kind Rings or customize your own Onefooter ring. 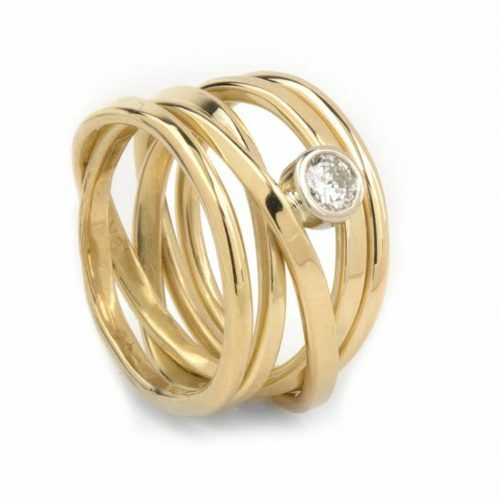 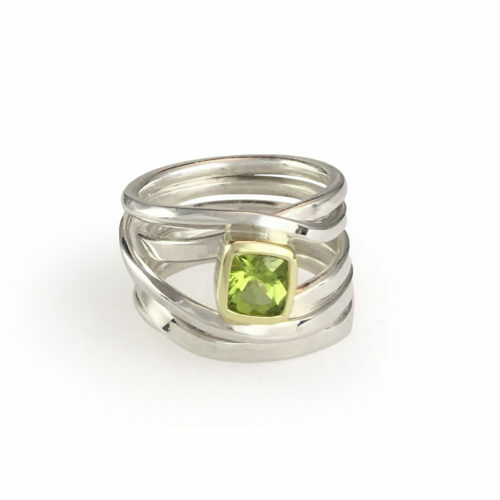 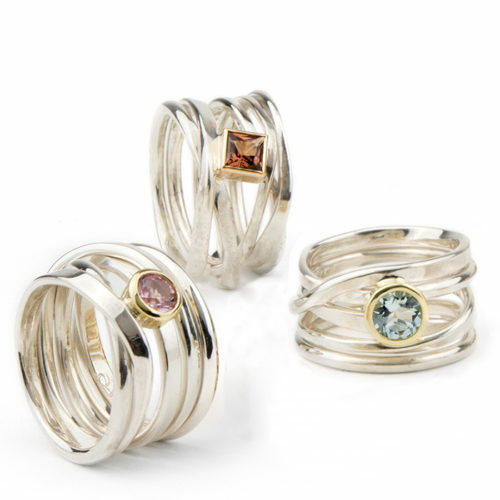 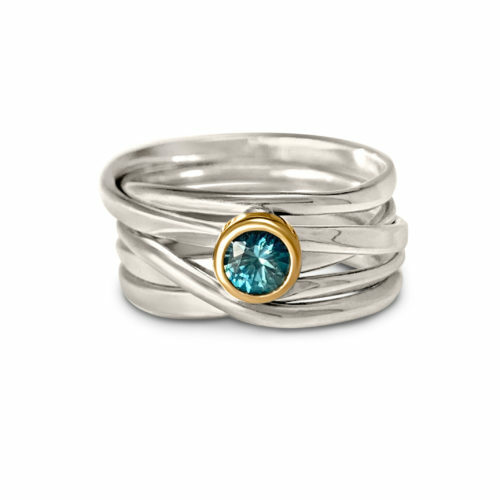 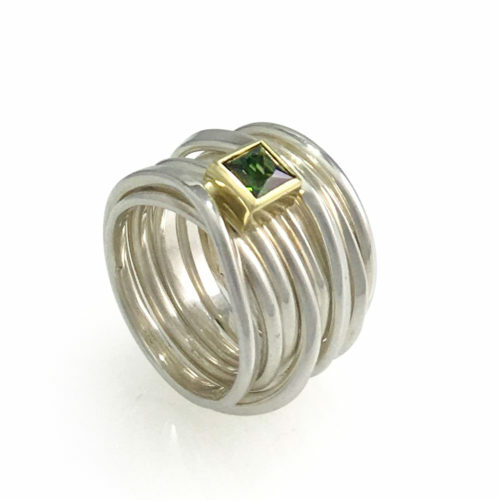 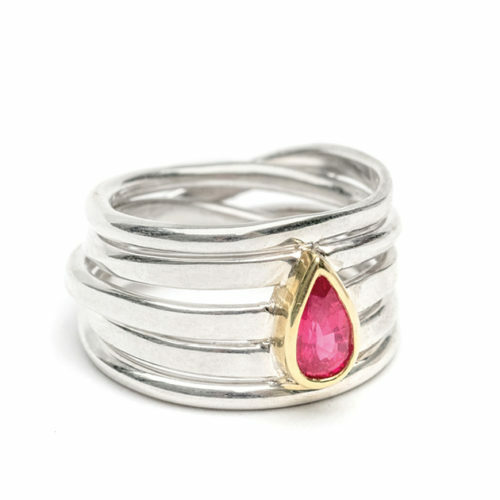 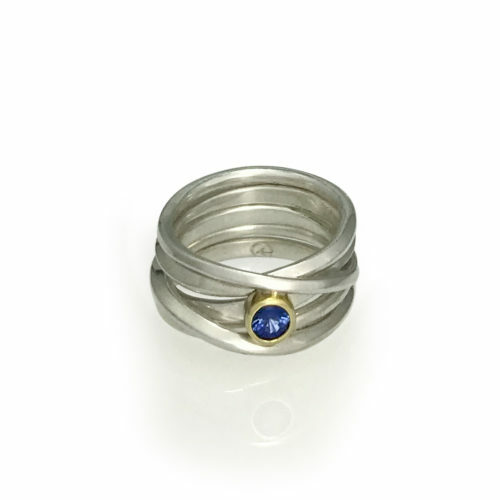 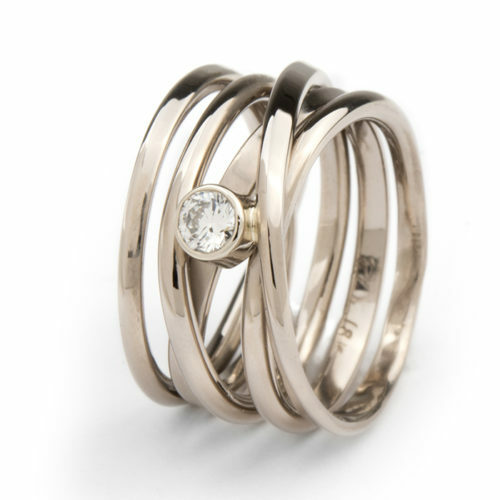 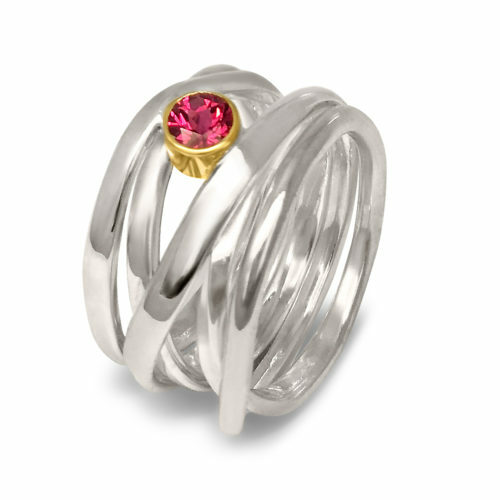 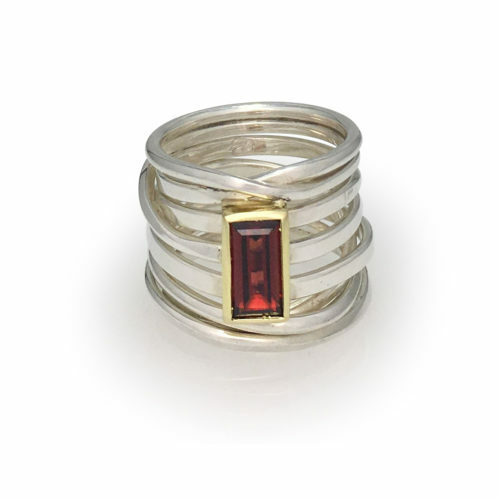 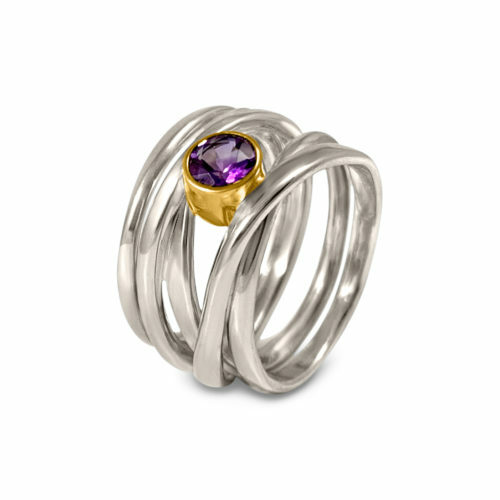 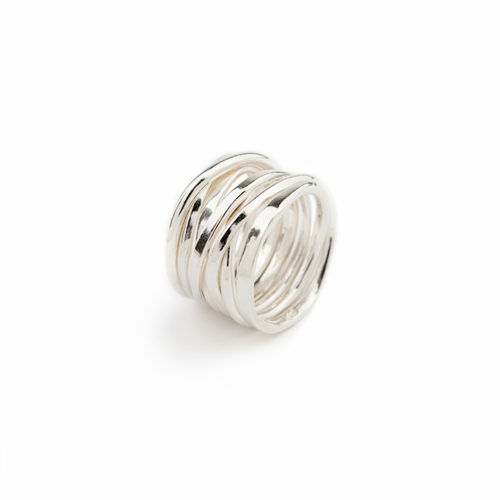 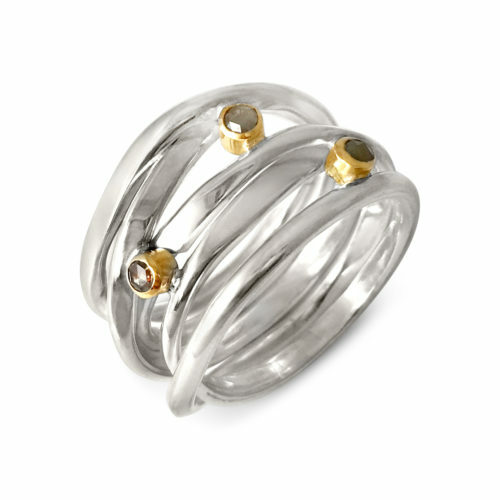 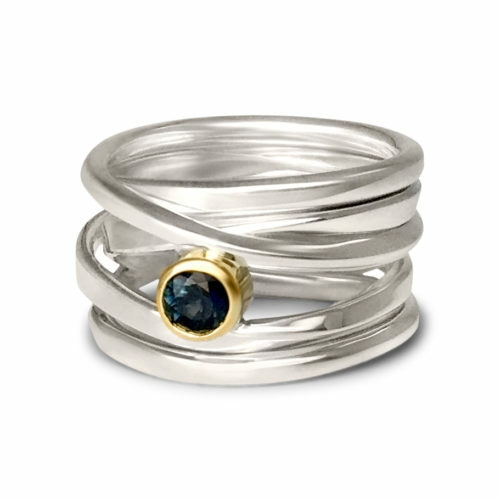 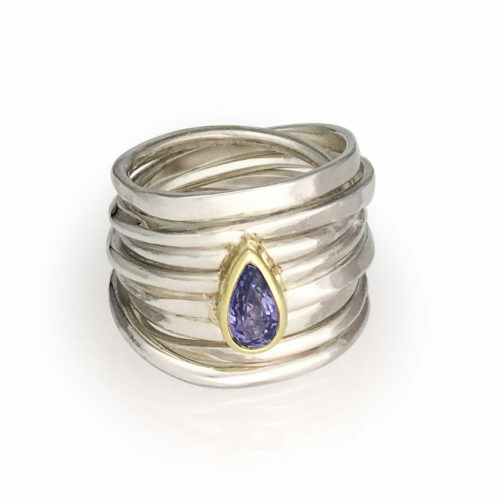 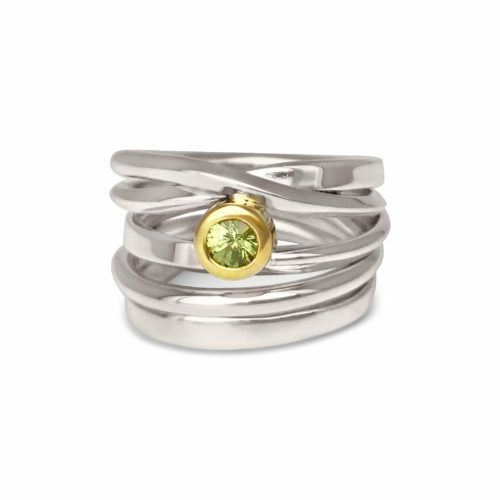 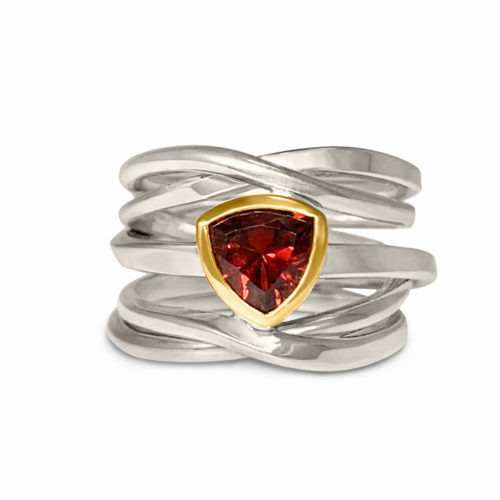 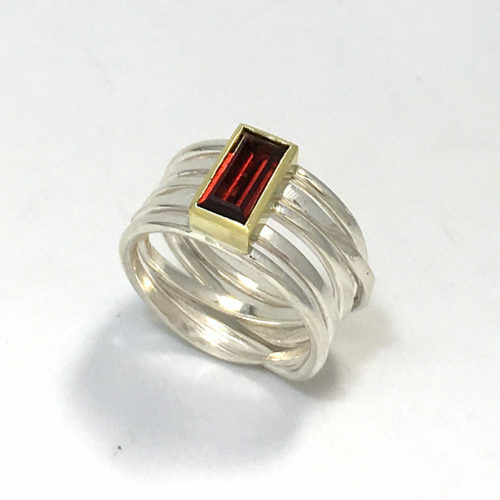 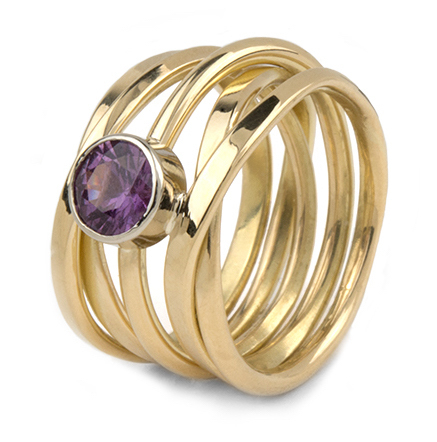 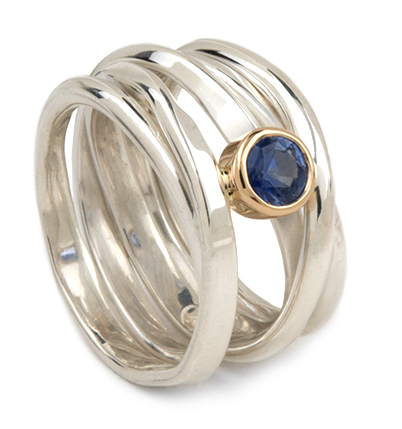 For even more rings, you can also inquire with a gallery in your vicinity. 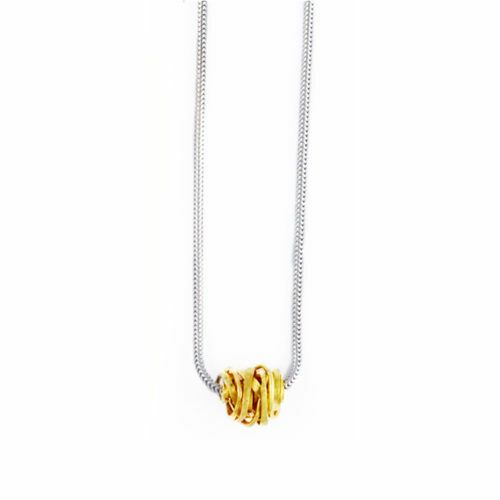 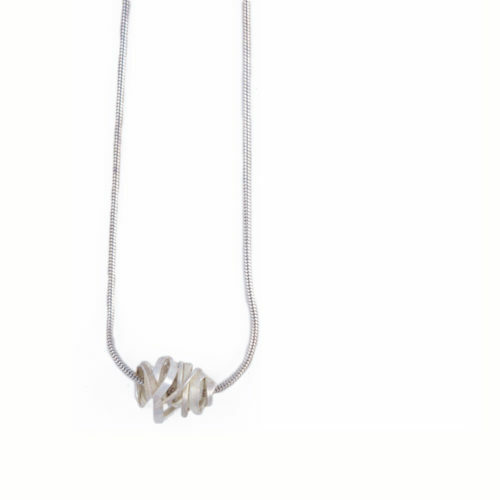 The necklace in the Onefooter series, like its companion Onefooter ring, is made from a one-foot-long piece of smaller gauge sterling silver or 18k gold wire. 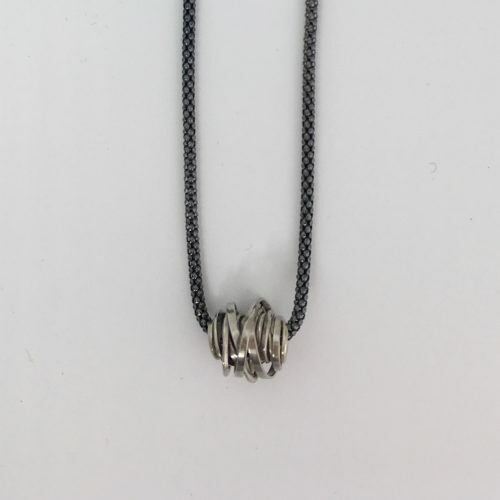 Because each ‘bead’ or ‘nest’ is made from individually forged wire, which is then wound by hand into a continuous loop, each necklace is totally unique. 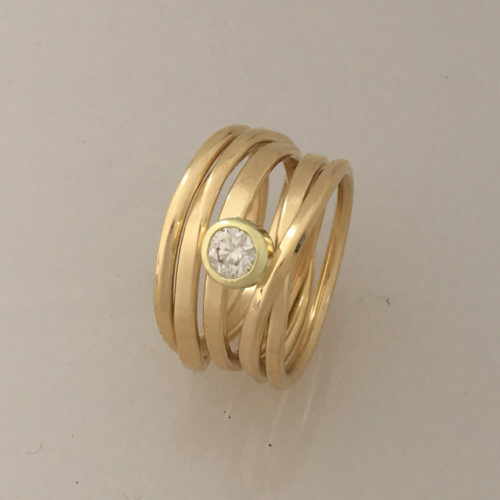 One-of-a-Kind #229 || Size 8.5 The sterling silver ring is a size 8.5, and inlaid with rosecut diamonds set in 18k yellow gold. 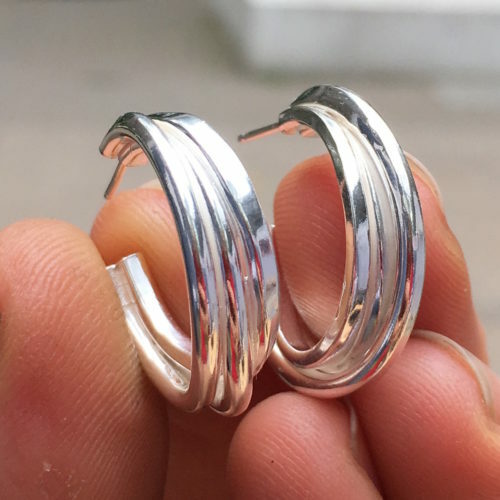 Not your size? 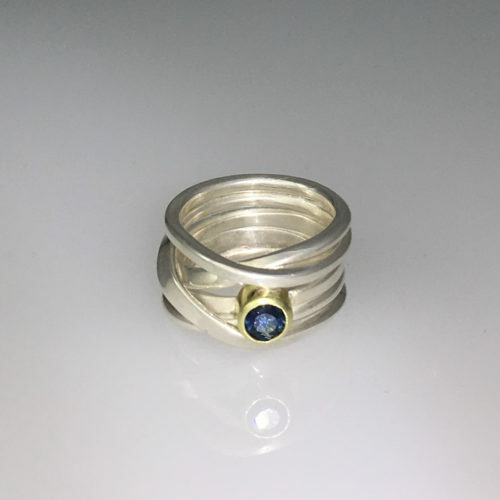 I can make you a similar ring in your size.